Well, winter is almost over according to the calendar but for most of us it's still hanging in there. 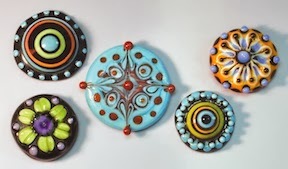 But no matter the weather, Bead Bonanza is around the corner and Fire Foxes Glass will be there. Here are some examples of her lamp worked cabs. By day she's a graphic artist and designer.